News Release Models Toyota Region U.S.
DETROIT, January 15, 2018―The roads of Avalon, the mystical paradise that inspired Toyota's flagship nameplate, have likely never seen a mid-premium sedan like this. Safe to say, neither has the North American International Auto Show. Until now. 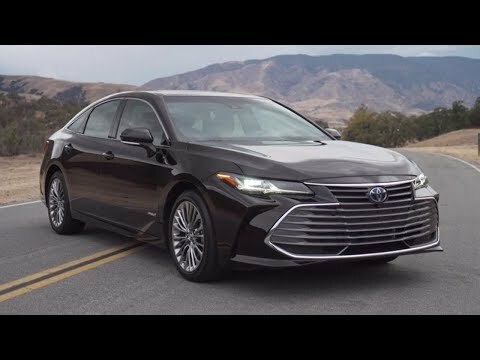 Underpinned by a Toyota New Global Architecture (TNGA) platform, and powered by a fuel-efficient 3.5-liter V6 or Toyota Hybrid System (THS II) powertrain, the 2019 Toyota Avalon embodies consumers' overarching desire for high-caliber, design-centric, technologically-savvy modes of attainable, premium transportation. Bar, you've just been raised. For its fifth generation, Avalon received an all-encompassing makeover by Toyota's U.S.-based design, engineering, and manufacturing entities at Calty Design Research Inc. (Calty) in Ann Arbor, Michigan; Toyota Motor North America Research and Development (TMNA R&D) in Saline, Michigan; and Toyota Motor Manufacturing, Kentucky, Inc. (TMMK) in Georgetown, Kentucky, respectively. Spearheaded by Chief Engineer, Randy Stephens, and Calty President, Kevin Hunter, the brain trust masterminded an Avalon that represents multilateral progressiveness―for itself, its diverse group of drivers, and, for Toyota. The teams minded two keywords throughout their development paradigm: Authenticity and Exhilaration. Both were applied in every area of Avalon's sophisticated essence, and throughout the four available grades: the athletic XSE (all-new) and Touring, as well as the more opulent XLE and Limited. Hybrid grades include XLE, Limited, and XSE. A wealth of Calty signature elements cocoons Avalon's long, low-slung TNGA musculature. Its expressive looks diligently reflect the mixture of all-encompassing, performance-focused personality, the invigorating driver experience, and a premium, spacious image. A philosophy of Technical Beauty permeates Avalon's body lines and cabin landscapes. Technical, which aligns with Authenticity, represents purpose and performance―tangible elements of the sedan's style. Beauty, which aligns with Exhilaration, represents onlookers' emotional reaction to Avalon's taut lines and sleek silhouette. Because of its adaptable TNGA core, the Calty team penned Avalon's exterior to be longer, lower, and wider than before. Unique, never-before-accomplished stamping methods also aided in the deep draw panels that express distinguishable sculpted forms. Complex surfaces could now be shaped, like at Avalon's door handles that coincide with its profile's bold character line. A distinct, carved lower rocker panel behind the front wheels visually exemplifies the benefits of TNGA. Avalon's dimensions echo the seductive physiques of high-dollar premium vehicles. Its cabin, however, keeps its characteristic low-profile heritage by extending the rear cabin farther by another 7 inches, and elongating side quarter glass and downward tapered C-Pillar by 2.2 inches. To finalize the ingenious profile, engineers and designers implemented a 0.31-inch radius corner―the tightest ever for Toyota―fore of the steep pillar. Avalon's various height measurements have been trimmed: overall (by 1 in. to 56.5 in. ), cowl (by 1.2 in. ), and rear deck (by 0.8 in.). So too have front and rear overhangs (down 0.4 in. and 1.0 in., respectively). Along with its wider front (up 0.4 in.) and rear (up 1.5 in.) tracks, width (up 0.8 in. to 72.8 in. ), and wheelbase (up 2.0 in. ), Avalon's premium aura and sporty stature are further emphasized. Nowhere is Toyota's "Under Priority" brand identity (a direction that prioritizes aerodynamic efficiency, cooling, and pedestrian protection) more clear than at Avalon's stunning face. Available slim all-LED projector headlights simultaneously speak to its sportiness and elegance. They're but a piece of the façade's compelling story, though, that depicts the intersection of three-dimensional surfaces and assorted functions―the aluminum hood's longitudinal lines and lightweight build; the wide, modern grilles built for air-slicing sleekness; tangential vents at its lower portion crafted for the effective direction of passing air across the front tires and along Avalon's buff flanks. The chiseled doors achieve a deeper character line thanks to TNGA prototype stamping applied at TMMK. Simple horizontal character lines slice across the backside, at the top, center, and lower portions. Its 72.8-in. width, in effect, is highlighted substantially by the distinct sectioning. Connected LED tail lamps shaped in a three-dimensional, "aero fin" style differentiate the landscape from the current iteration. They integrate backup, stop, and turn lights into a single harmonious, fluid form. Differences between the grades are clear. A dark gray front grille with chrome border, for instance, is a telltale sign of the XLE and Limited versions. So too are the machined-silver LED headlight bezels, body-color rearview mirror housings, and unique wheels ranging in diameter from 17 to 19 inches. Chrome badge letters, as well as dual exhaust with quad chrome tips individualize the grades. A more aggressive attitude is worn by XSE and Touring. A piano black mesh grille, machine-finish and Gloss Black wheels, as well as black outer mirror housings are special to the grades. Headlight bezels―also in black―create an engaging mystique never before possessed by Avalon. Rear traits include trunk lid spoiler and badging in black, and a grade-specific lower diffuser set above and between quad tailpipes. Form follows function in Avalon. The tangential vents at the front, its rear spoiler, and the substantial underbody panel coverage, from front nose to tail, minimize aerodynamic inefficiencies and give Avalon a 0.27 coefficient of drag―besting the outgoing model's 0.28 Cd. Avalon's available LED Vision Tech headlamps are the most advanced lighting realized by Toyota. The slim headlights employed by XLE and XSE grades utilize a cluster of three reflectors for Daytime Running Lights (DRL) and low- and high-beam functions, providing exceptional light disbursement in an array of situations, including foul, low-visibility weather. For Limited and Touring, each headlamp is comprised of thin lighting modules―one for low beam, another for high―plus, an Adaptive LED Cornering lamp and a Dynamic Auxiliary Turn Signal. Each is a Toyota First. The innovative cornering lamps enhance visibility around corners and curves during low- and high-speed maneuvers, as well as when changing lanes or when reversing. The lamp fades in and out for seamless activations and transitions, and adds 60 percent more foreground width to the low beam's pattern. The Dynamic Auxiliary Turn Signal provides an added degree of noticeable visibility by activating each auxiliary diode in sequential fashion, rather than all on, all off. Avalon's LED taillights also implement laser ablation on Limited and Touring's units, as well as Dynamic Auxiliary Turn Signal. The lamps' three-dimensional Aero Fin Jet makeup insets the reverse indicator below the rear lamp, effectively widening the look of the housing, and, in turn, the sedan's muscular hips. Avalon's fluency in luxuriousness and exhilarating extroversions isn't restrained to its provocative looks. Its TNGA platform's thin structural pillars and broad windshield lend to the wide, open impression that passengers garner, be they seated in front or rear rows. Upon opening Avalon's doors, an overarching simplicity and a purposeful placement of amenities and controls welcomes passengers. Authentic materials, such as the available Yamaha-sourced wood-trim and authentic aluminum pieces, accent arm rests, center console, and instrument panels. Soft-touch materials are noticeable throughout―around the flowing, low-profile center console decorated in piano black trim; on the slim, tiered instrument panel leading into the doors; in the rear compartment, where doors and console mirror the impressive craftsmanship seen in the front cockpit. A rear cup and device holder, accented in piano black and satin chrome-finish, folds up and down in the armrest between passengers. Ahead of their knees and within arm's reach: air vents, controls for the available seat warmers, and essential USB charging ports. Deep curvatures in the doors' armrests provide passengers with ample surface area and comfort during long commutes. Rear seat roominess is exemplified by Avalon's segment-best measurements in three categories: shoulder room (57.1 in. ), leg space (40.3 in. for V6; 40.4 in. for Hybrid), and headroom (37.5 in. for V6; 37.1 in. for Hybrid). Material differentiation between grades is minimal; engineered wood trim is found on XLE, while Limited features real wood trim. Aluminum pieces adorn Touring's and XSE's cabins. A mix of Perforated Ultrasuede wraps all seating in Touring and XSE; Softex seats within XLE receive artistic vertical stitching. Limited goes beyond this creative approach by adding a quilt pattern, special perforation, and two-color stitches―all unique to Toyota. New-for-2019 Cognac colored leather-surfaces highlights Limited's upscale vibe. Joining Cognac in Limited's color quiver are available gray and beige leather-trim; XSE and Touring can be had in either gray or black Perforated Ultrasuede; XLE receives a trio of color offerings with gray, beige, or black Softex. At the front seats, attentions are immediately fixated on Avalon's slim center stack. The thin panel houses Avalon's 9-inch multimedia system (MMS) displaying audio and navigation, and integrates the automotive climate control system. Satin chrome-finish decoration surrounds the center cluster panel that "floats" above the instrument panel, further emphasizing the balanced aura of the modern atmosphere. Below the panel, passengers have easy access to the slide-open eBin containing a 12-volt plug and the standard wireless Qi mobile device charger. A trio of USB power ports (making for five total) is located inside the center console. A part cup-holder, part phone cradle located atop the front console, sits adjacent to the gear selector; supple padding lines either side of the console's lower tunnel at knee height. A three-spoke steering wheel welcomes drivers' eyes and hands with smooth, satin chrome-finish accents and conveniently placed multifunction controls. Visually, the wheel's aesthetic is neater, having a trimmed inner physique and smaller switch cluster, while hand grips have been enlarged. Cruise Control is now accessible on the wheel's right spoke. Also for the first time in Avalon, the steering wheel can be wrapped in a two-tone leather-surface when outfitted in Cognac or gray. Past the steering wheel, a 7-inch Multi-Information Display (MID) shows vehicle information, turn-by-turn navigation, and various vehicle settings (including those pertaining to Lane Departure Alert with Steering Assist, Pre-Collision System with Pedestrian Detection, available Intelligent Clearance Sonar, Blind Spot Monitor with Rear Cross-Traffic Alert, and Head-Up Display). Two new menus can be accessed by drivers, including a digital speedometer and, in Hybrid grades, a digital tachometer when its shifter is in "S" mode. On the MID's left, there's a tachometer with long bright white needles and updated typeface. On its right, a speedometer. Hybrid grades receive the same central 7-inch screen, but to its left sits a Hybrid System Indicator showing the vehicle's regeneration status in CHG (charge), ECO (economy), or PWR (power) in real time. Save for XLE's gauges, the tachometer/hybrid powertrain meter and speedometer on XSE, Limited, and Touring are surrounded by 3D Glow Rings. A chrome ring borders the entire meter cluster on all grades. Limited and Touring's standard color 10-inch Head-Up Display (HUD)―the biggest in the segment―clearly projects important info, such as vehicle and engine speeds, turn-by-turn directions, audio settings, and drive mode, right onto the lower portion of the windshield. It helps drivers stay focused on the road ahead, and is one third of Avalon's "driver control zone" made of MMS, MID, and HUD. All of them align seamlessly for optimum communication between occupants and vehicle. The system's new 9-inch capacitive touchscreen can be pinched and flicked, just like personal mobile devices―perfect for pinpointing your favorite pizza joint. Its refresh rate is quicker, its voice recognition is more perceptive, and it better recognizes users' gestures. Avalon will also feature Toyota's first integration of smartwatch or Amazon Alexa-enabled device connectivity, as part of Toyota Remote Connect. This innovative connection allows drivers to lock/unlock their doors, start their engine, or check their fuel level, all from the convenience of their smartwatch or Amazon Alexa-enabled device. It's voice controllable too, and compatible with select Android or Apple devices. Toyota is among the first automakers to feature Amazon-enabled device connectivity capable of executing home-to-car and car-to-home interactions. With a standard 14-speaker system―the most speakers in the segment―and full suite of Entune 3.0 Premium Audio, passengers seated within Limited and Touring grades are treated to unprecedented aural and visual stimulus. Many Toyota-first applications with advanced software and hardware are optional for XLE and XSE drivers as well. They too can be equipped with embedded Dynamic Navigation. The VVT-iW system is employed on the intake cycle, with VVT-i (Variable Valve Timing―Intelligent) activated on exhaust. With VVT-iW in place, engineers ensured optimal torque creation at all engine speeds, and minimized pumping losses during the closing of intake valves, which furthered fuel efficiency. The use of Atkinson cycle, too, reduces the V6's fuel appetite, particularly in cold climates or during wide-open throttle (WOT) situations. An all-new TNGA 8-speed Direct Shift-8AT automatic transaxle gearbox (UA80E) channels power to the Avalon's front wheels. It merges smooth, precise gear selection throughout the RPM range with an alacrity for fuel efficiency and on-demand power. Its revised logic control better matches vehicle speed, engine speed, and torque engagement, while also facilitating poised downshifts. 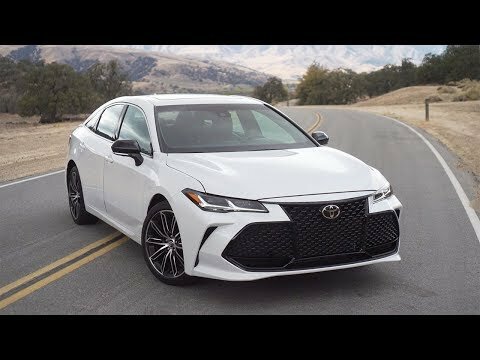 The most thrilling shifting experience, however, is reserved for XSE and Touring drivers, whose optional steering wheel-mounted paddle shifters up Avalon's sportiness ante without question. The paddles give quick access to gear selection, and when downshifting, the gearbox automatically "rev-matches" for smoother shifts. A new TNGA 2.5-liter four-cylinder Dynamic Force Engine is more fuel efficient, runs cleaner, and is more powerful than previous iterations, and excels at dissipating thermal inefficiencies. Doing it all took the implementation of Toyota's vast catalog of advanced engine technologies: Dual VVT-i with VVT-iE (Variable Valve Timing intelligent system by Electric motor); D-4S (Direct injection 4-stroke gasoline engine Superior version) direct injection and laser-clad valve seats; longer stroke (4.07 inches; bore remains at 3.44 inches) and high compression ratio (14:1); multi-hole direct fuel injectors; a variable cooling system; cooled Exhaust Gas Recirculation (EGR) system; and a full variable oil pump. The four-cylinder Dynamic Force Engine is married to an all-new Toyota Hybrid System II powertrain that's been engineered to inspire both spirited driving and fuel consciousness. THS II uses two electric motors―MG1 and MG2―to supplement the charging of the hybrid system's Nickel-Metal Hydride (Ni-MH) battery pack, while MG2 assists the engine. New for 2019, the highly compact battery pack now resides under the rear passenger seat (instead of the trunk), as a result of improved TNGA packaging and for the betterment of a lower center of gravity. THS II's new lighter, smaller Power Control Unit (PCU) packages microcontrollers within a power stack structure that's located above the transaxle―all with the goal of lowering mass to better handling composure. Efficiencies on many levels are seen with the implementation of the new PCU. Energy loss in the conversion efficiency of the transaxle and electric motor is reduced by approximately 20 percent, and its cooling system's energy loss is cut by approximately 10 percent. The PCU's DC-DC converter―which converts a direct current from one voltage level to another―is optimized to reduce overall power consumption. Dimensionally, DC-DC converter's output filter is smaller, lighter, and quieter for an improved passenger experience. Auto Glide Control (AGC), yet another of Avalon's fuel-saving technologies, automatically calculates efficient coasting. When driving normally, engine braking will slow the vehicle down when the driver lifts off from the accelerator pedal. However, to avoid aggressive engine braking, AGC limits the loss of vehicle speed through an automatic drive setting that acts more like a neutral gear, allowing the vehicle to coast to the stoplight. A light indicating "AGC" is illuminated on the Multi-Information Display (MID) when AGC is active to alert the driver that less deceleration torque than normal is currently being used. AGC can only be activated when the vehicle is being operated in the ECO drive mode setting. Adding more than a sprinkle of spark to Avalon Hybrid's sporty skillset is the inclusion of a new Sport drive mode and Sequential Shiftmatic technology. The Sport drive mode applies power from the hybrid system for improved acceleration and, as a bonus, all drive modes, including Sport, can each be used while EV mode is activated. With Shiftmatic technology, XSE drivers can "shift" through the Continuously-Variable Transmission's six simulated gears via steering-wheel mounted paddles or the gearshift. Complementing Avalon's daring looks is a thrilling drive personality imbued by an array of available sport-oriented tools―which, together, represent a Toyota first. Adaptive Variable Suspension (AVS), Intake Sound Generator (ISG), grade-specific exhaust baffle tuning, Active Noise Control (ANC), and Engine Sound Enhancement (ESE) fully exemplify Avalon's most adventurous zeal ever. A more comprehensive four-level drive mode selection―which includes Eco, Normal, Sport/Sport+, and Custom―is available on Touring, too. All other grades receive a three-level drive mode selection (Eco, Normal, Sport). Touring's standard Adaptive Variable Suspension (AVS) provides real-time damping control to maximize controllability and sharp handling. The astute setup reduces Avalon's posture fluctuations under hard or sudden directional changes, limits body movements, and yet absorbs nasty road undulations for a comfortable, flat ride. AVS relies on three primary systems to accomplish its mission: shock absorbers at each corner that have solenoid control valves for independent wheel control; advanced front and rear G Sensors to comprehend the vehicle's condition; and, an intelligent central ECU that reacts to the G Sensor's observations by dictating exact damping adjustments to the shock absorbers' solenoids. Levels of AVS' damping force are continuously variable, with a maximum of 650 steps. Changes in solenoid force―which restrict absorber fluid and, thus, damping―happen in an incredible 20 milliseconds. Drivers can adjust Avalon's ride feel with the simple depression of a button―Normal mode prioritizes comfort, while Sport+ emphasizes handling with tauter, highly responsive footing without diminishing Avalon's celebrated ride suppleness. Progressing from Normal to Sport+ also benefits Avalon's liveliness. For example, throttle response becomes quicker, the Electronic Power Steering's (EPS) feel emphasizes feedback, and its engine sound is enhanced through ESE. The new multi-link rear suspension allows for the enhancement of many positive performance attributes, such as a wider rear track, lower center of gravity, and an aggressive stance. Revised trailing arms have been installed at a higher position to place the pivot axis of the tire rearward for better bump absorption. The setup's shock absorbers are tilted forward, too, to realize a suppler ride. Bushings on the trailing arms and arm joints further mask passing road imperfections. Avalon's refined acoustic repertoire spans inside and out. Through Sport+, passengers receive a concerto of exciting, natural sounds through a new exhaust system with sport modified baffles, an Intake Sound Generator (ISG), Active Noise Control (ANC), and Engine Sound Enhancement (ESE). ISG amplifies the engine's air inhalation sound to create robust vocalization and, on the exhalation end, the all-new exhaust with baffle tuning ups the sound character at start-up, idle, and acceleration. ANC and ESE work to cancel any unwanted exterior noise while simultaneously enhancing engine sound via the JBL multimedia system's in-cabin speakers. Exceptional engine notes at start-up are also enhanced; a hearty "flare" of sound occurs right before idle upon start-up. At wide-open-throttle acceleration, more engine grunt is heard throughout the rev range. Avalon's standard Toyota Safety Sense P (TSS-P) suite of safety systems and technologies represents one step closer to achieving Toyota Motor Corporation's ultimate goal of zero casualties from traffic accidents. All 2019 Avalons have 10 standard airbags and Toyota's Star Safety System, which includes Enhanced Vehicle Stability Control, Traction Control, Electronic Brake-force Distribution, Brake Assist, Anti-lock Braking System, and Smart Stop Technology. All Avalons also come equipped with a standard backup camera. For over two decades, Avalon's sole manufacturing home has been Toyota Motor Manufacturing, Kentucky (TMMK) in Georgetown, KY. All Avalons sold in America and around the globe are assembled in Georgetown by about 8,000 proud American team members.